This was actually made over a week ago. I had queued up a couple recipes as we last Friday we headed to the airport to fly to visit Angela’s parent’s for Christmas. We made it to the airport with plenty of time to spare. Our flight took off on time and it looked like our trip would be uneventful. And then we arrived over Milwaukee. And entered a holding pattern. We circled for about an hour until we were told we were running out of fuel and had to divert to Madison. Flaps were out, landing gear was down, and we were approaching the run way. I could just see the landing lights through the fog and then the pilot gunned the engines and pulled up. Turned out we had to abort the landing as air traffic control wasn’t sure whether or not there was another plane on the runway. We were able to turn around and land successfully. And then we had to wait to get our luggage. And then take a bus to Milwaukee where we found out we could get a flight out the next day. The airline was nice enough to give us a hotel to stay in (of course, they gave us the wrong name of the hotel first and once we got the correct name gave us incorrect information as to how to contact them). The next day was as fogging as the last. And pretty quickly our flight was canceled. We rebooked for the next day and went to another hotel. So, after two days, the fog cleared and we showed up at the airport again, a bit hopeful, a bit apprehensive. At first, our flight was going to be delayed. And then it was on time again. When we saw the plane at the gate, Angela did a happy dance. And when, sitting at the end of the runway, the pilot revved the engine and we started accelerating, I had one of the biggest smiles on my face ever (not quite as big as my wedding day). And I’ve never been happier to be in Florida. Of course, this has nothing to do with the apple tart. 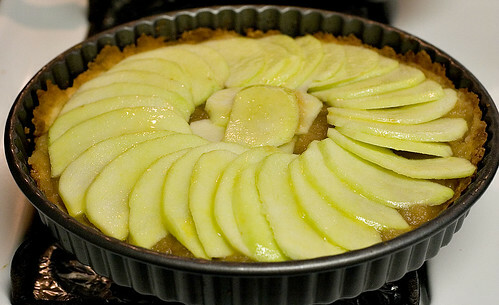 I like apple tart’s quite a bit and am always looking for new ones to try. For some reason, I tend to like them better than apple pie. It may not be very American of me but it’s true (call homeland security!). 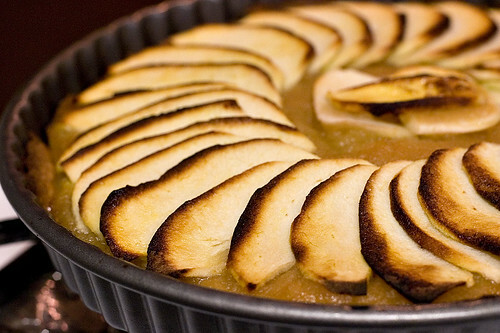 This apple tart is mostly apple sauce in a tart shell covered with sliced apples. It’s very simple. It doesn’t even use cinnamon. It’s apples at their simplest. When I made it, the green apples we had were extremely tart. So tart that I felt the need to sprinkle sugar on top of the tart even though the original recipe didn’t call for it. And it was still tart. So be aware. 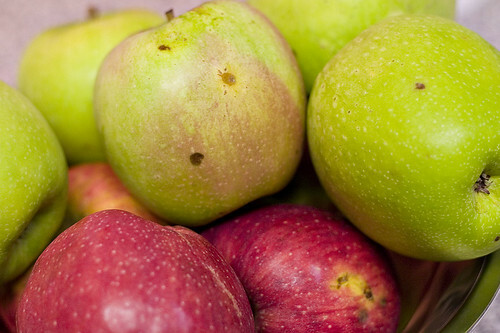 Cut the apples into chunks and place in a large saucepan. Mix in the water and brown sugar. Cover and heat over medium-low heat. Cook at just below a simmer until the apples are soft, about 15 to 20 minutes. Remove the pan from the heat and run the apples through a food mill fitted with a disc with the largest holes. Taste the sauce and add sugar if necessary. Allow to cool to room temperature. The sauce may be refrigerated for several days. Fill the tart shell almost to the rim with the apple sauce. Peel and core the green apples. Slice them thinly. Arrange the apple slices in a spiral pattern on top of the apple sauce. Rub the cut apples with the egg wash and sprinkle with the sugar. Bake the tart for 45 to 50 minutes. Place the flour, sugar, and salt in the bowl of an electric mixer fitted with the paddle attachment. Mix briefly, until the ingredients are well combined. With the mixer at low speed, add the butter 1 tbsp at a time. When the butter is fully added, increase the speed to medium, until the butter and flour mixture forms pea sized granules. Reduce the speed to low and add the egg yolk. Increase the speed to medium and mix until the dough is slightly sticky. Remove the dough from the mixer bowl and press it into a fluted 9-inch tart pan. Put the tart pan in the freezer and freeze for at least 30 minutes. Press a greased sheet of aluminum foil onto the tart dough. Bake for 25 minutes. Remove from the oven and remove the aluminum foil. Press down any places the dough has puffed. Allow to cool before using. It probably wasn’t my favorite apple tart ever but it was still good. Sometimes it’s nice to try something different. I know you tried to direct me to a post on your site and I haven’t been able to figure out which one you were referring to. My Italian isn’t that good so it’s harder to find it. And I think I have a post coming up that might be something you can comment on.